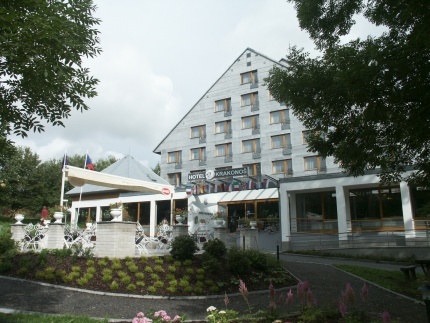 Hotel Krakonos is located amid the beautiful forests above the spa town of Marianske Lazne (Marienbad), about 1,5 km from the town centre. Public transport by town bus No. 12, stop at the hotel or funicular with end stop next to the hotel. The hotel offers 58 double/twin bedded rooms, 2 rooms for disabled guests and 6 suites. All rooms with en-suite facilities, TV set, telephone and fridge. Access to the hotel also by regular public bus line and cable cabins.